Newcastle, Manchester, Sheffield or Birmingham? At a glance one would guess that this photograph was of a factory in perhaps Newcastle, Manchester, Sheffield or Birmingham; so readers will be surprised to learn that it was actually taken at the CVA factory in Portland Road Hove around 1965. Just nearby, in the beautiful residential area of New Church Road and Wish Park, desirable houses now sell for in excess of one million pounds, and heavy industry would be very out of place. While a foundry close to the beautiful residential area would not be tolerated today, when it opened the world was very different, and it provided much needed employment to many who lived on the estates nearby to the north. This continued right up to 1969/70 when it closed and castings were replaced by heavy steel fabrications, with any small requirement for castings being sub-contracted. I worked at CVA in the 60s but in the machine shop. It was a large site and I never got to see all of it. 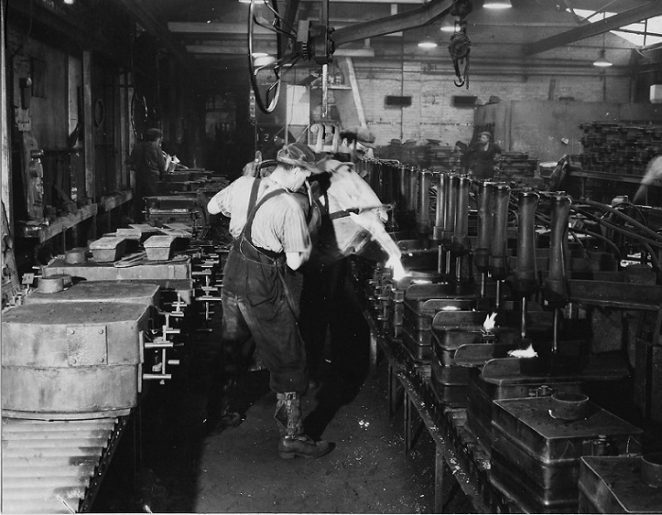 Hi Peter, great photo of the CVA/K&T foundry. I think the foundry may have still been in use in 1972, all be it at a reduced capacity. I remember going over there while at the training school at Coombe Road No 3 factory. Gil Percy took some of us apprentices over when they were having a pour which I believe happened twice a week. I remember the foundry just as your photo shows – a cauldron of molten iron was tapped from the furnace and moved along the I beam track on the ceiling, the individual pre-made sand molding boxes were then filled with molten metal and left to cool before being broken open the next day. You are dead right it was a dirty smelly place, quite out of place in the middle of a Hove residential area. Interestingly as the main west coast rail line ran just behind the foundry, a spur line was added to offload raw materials to the foundry, the spur track was removed in the 1970s. My first job after leaving school in 1965 – I delivered and collected the post from all the departments twice a day. The foundry was the worst place to go into. Luckily I got a place in the Accounts department so I didn’t have to go in there after that. Happy days. Sorry forgot to mention that my dad, Bert Feaver, also worked here. Handy for a lift home!